The Zombie Apocalypse Guide to 3D printing is written for the person who wants to use their printer to make practical, durable items for everyday use. Whether rebuilding civilization from your jungle hideaway, fighting off zombie hordes, or just printing a new plastic bit for your latest project, The Zombie Apocalypse Guide to 3D printing has what you need to get the job done. If you are going to buy just one book for your 3D printing toolbox, this should be it. With 180+ pages and more than 65 illustrations and photos, this easy to read volume contains sections on: – designing for 3d printing – optimizing your designs for strength and printability – printing at 2x+ speed for prototyping – leveraging “vitamins” to multiply the usefulness of your printed designs – how to template and prototype replacement parts – calculating safe working loads for printed objects – basic paradigms for 3D design – calibrating and adjusting your printer – troubleshooting common printing problems – operating your printer from improvised power supplies – and much, much more. With a tongue in cheek nod to the zombie mythos, this volume will enable you to manufacture things on your desktop that you might otherwise have to purchase, painstakingly craft, or do without. 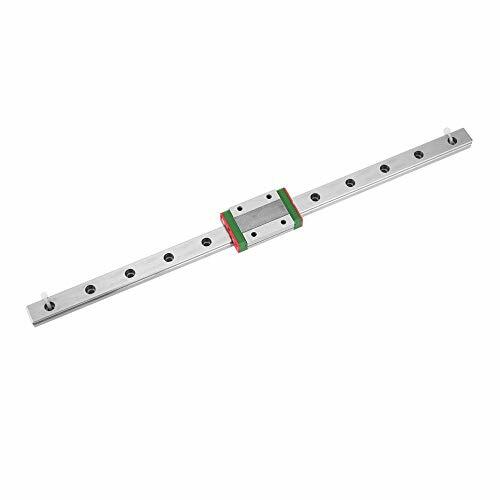 Emphasizing independence and solving practical problems, this book will help the reader to design and manufacture new items as well as making perfect fitting repair and replacement parts. 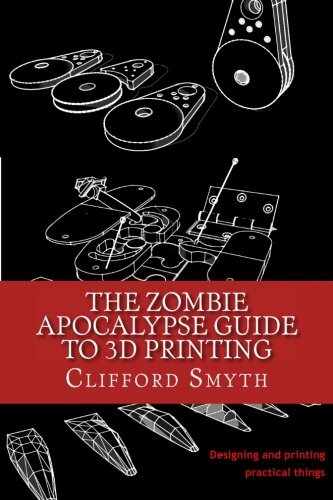 No matter what type of 3D printer you use, reading The Zombie Apocalypse Guide to 3D printing will help you to improve your design skills and understand critical technical details, help you to identify and correct common printing problems, and expand your horizons in the 3d printing with the use of the most effective design methods. Paperback, 187 Pages, 68 Illustrations. Stop wasting time trying to remember print settings or scrolling through websites to learn about new materials. Great visual reference to keep by your 3d printer whether you are a seasoned pro or just beginning. Descriptions for each material outline best uses and material properties along with tips that will help keep your prints successful every time. 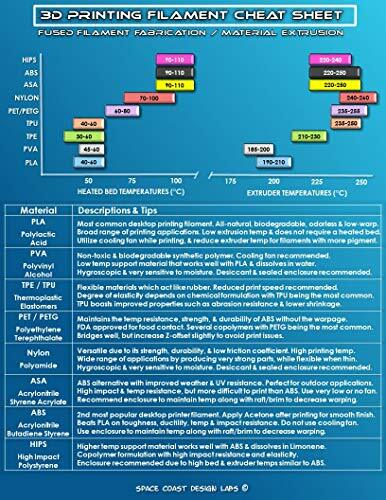 Easy to read graphic shows both extruder and heated bed temperature settings based off research from the most popular filament manufacturers and printing experience. Sealed in a waterproof, high quality, 5mil thick lamination that will last. Thinking about trying to use a new filament, but not sure if it is compatible with your 3d printer? What support material should be used with PLA vs. ABS? What materials need an enclosure for best print quality? Which filaments have to be stored in sealed containers due to moisture absorption? …Just check this simple guide to find out in seconds.